All in One Caterers and Event Mangers are back with a Bang.!! 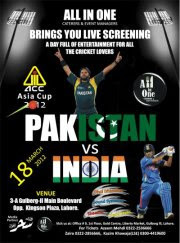 Live screening of Pakistan vs India Match of Asia Cup on 18th, March, 2012 live from Dhaka. Come And rejoice the match and inshallah the 'winning moments' LIVE on Large LCD's and Projector Screens. Lots of music and Dhamaal to enjoy every boundary or Six hit by out batsmen and enjoy every wicket taken by our bowlers and thus make you Rock 'n' roll. PAY FOR YOUR SELF AND ENJOY ALL OF THESE AS MUCH AS YOU CAN!! * Sheesha will also be available on spot.